This is the Poly-Mart 3/4" Standard Bulkhead Fitting. 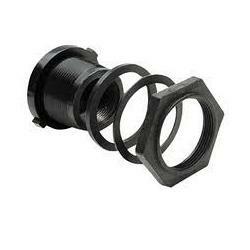 These fittings are available in various sizes including 3/4" , 1" , 1 1/2" , 2" , 3" and 4" . All Poly-Mart Tanks include a standard sized Bulkhead Fittings which vary in size and quantity depending on the capacity and style of the tank you select. This flanged fitting is installed from the inside of the tank. The flanged fitting and the EPDM Gasket stay on the inside of the tank while the Plastic Washer and Nut stay on the outside of the Tank. These fittings are reverse NPT threaded on the outside threads and standard NPT threaded on the inside. All fittings are named by their inside measurement.